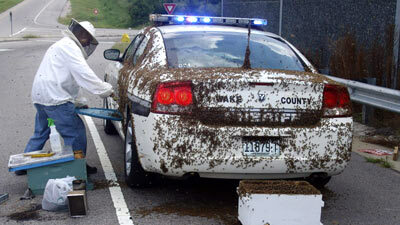 A police officer was trapped in his patrol car for three hours – by 50,000 angry honeybees. Sheriff’s Deputy Brandon Jenkins, 31, had been called out after a lorry broke down near Raleigh, North Carolina. The lorry was pulling a trailer loaded with 60 boxes of bees and the insects had escaped, reports the Daily Telegraph. Deputy Jenkins arrived at day break just as the bees were waking up and they swarmed him, forcing him to retreat to his car and radio for back up. More via Policeman trapped – by angry bees | Orange UK. A beekeeper had to be called after a swarm of 20,000 bees attached themselves to an Australian woman’s washing.They made a bee line for some colourful pants and socks hanging on a washing line in Victoria, Australia.Beekeeper Brian Gardiner, who was called to clear the insects, said the woman had been terrified when she saw the bees attached to one of her socks. More via 20,000 bees – Orange UK. A Chinese couple have got married wearing clothes made of thousands of living bees. Li Wenhua and Yan Hongxia are both enthusiastic beekeepers and work for the Nanhu forestry commission at Ning’an city in northern China. via Ananova – Bee my wife. A truck containing 330 crates of bees, about 12 million of them altogether, overturned on a major highway near the town of St Leonard, New Brunswick, in Eastern Canada on Monday, setting free thousands of irritated stinging insects. Police sealed off the vehicle and called for expert help with the millions that were left inside. “Trying to unload 12 million agitated bees out of the back of a truck would not be a good situation,” said Derek Strong, a local spokesman for the Royal Canadian Mounted Police. You’ve heard of busy bees. How about church bees? A religious beekeeper in Serbia has started making beehives shaped like tiny monasteries and churches “because bees have a soul too”. 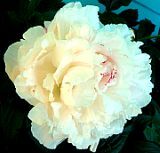 April 28, 2008 Posted by oldstersview | People, Strange	| Add new tag, bees, church | Comments Off on You’ve heard of busy bees. How about church bees?